The coordination of the gorgeous “red” flowers which much the festive spirit of the wedding reception and the seasonal “fresh green”. With the fresh and cool image of Spring and Summer season as a concept, we suggest the color coordination of the noble purple, green and white those have been used by the imperial family from ancient times. 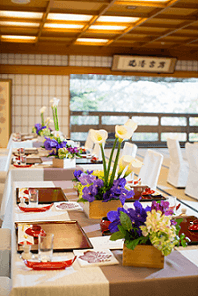 I traveled to Kyoto to attend a wedding consultancy fair held at “Saami (ryoutei restaurant)” on February 15th. 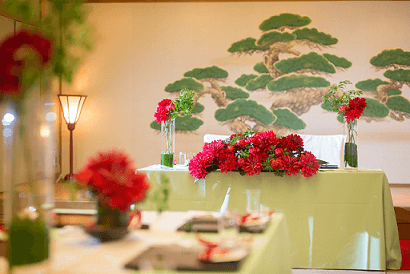 For 12 years, we have been proposed LST’s original wedding reception plan with traditional Japanese taste at Saami twice a year (Summer and Winer). Saami is a really great place where you can have superb dishes with the excellent service by the madam and all the other staff. 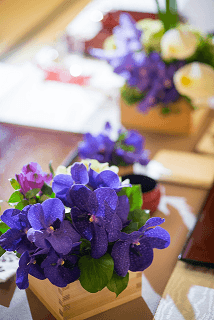 All the guests enjoyed the performance and the service by Maiko and Geiko and took pictures with them while they were eating the traditional Kyoto cuisine. 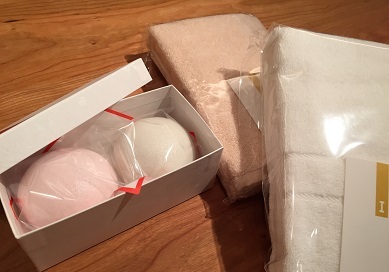 The souvenir gifts were “red and white manjuu (Japanese sweets)” of “Tsuruya Yoshinobu” and “imabari towel” from LST BOTAN. We appreciate that so many guests participated in the event that “Seifu-den” room was nearly full. And we would like to thank for all who helped us organizing the fair.